The mobile web is an underrated part of the mobile economy. Despite the fact that SmartInsights reckons that the mobile web only captures 11% of mobile usage (in comparison to apps capturing 89%), Google’s insights into how users discover items for purchase shows that search powered by the mobile web out guns search in apps. And as a result of the mobile web being underrated, by extension the opportunity to advertise natively within the mobile web has also not been fully tapped. But how can your business make the most of it? Here are some of our top tips. If you think about mobile web in general, not even going to native advertising, mobile web is a transition between desktop and apps. It’s a middle ground that exists on mobile browsers like Safari, which is one part mobile ready and one part a legacy from the online web, and is used to consume content particularly from editorial websites. This has evolved in some interesting ways over the years. You’ve seen companies coming from traditional desktop a few years ago with a regular website that can be read on mobile devices. Then they moved to responsive mobile sites, which adapted to the device of the user. And now, sites like the New York Times are moving to apps to host their content. But not every site is transitioning into an app and this is why the mobile web matters. Although it might be a smaller part of the overall mobile equation, advertising providers who operate in the mobile web like Taboola and Outbrain are helping to drive a billion dollar opportunity in this transitory market – which you could get a cut on. As with all types of native advertising, the context of the platform and the formats available to an advertiser define the opportunity. For anyone looking to go native on the mobile web, written content marketing is one of the best opportunities around. Sites like Buzzfeed and The Guardian offer room for advertisers to create content in their frameworks and native advertising that leverages this is less likely to irritate users than regular advertising. Furthermore, other types of editorial content can fit into this framework. Although Youtube and Soundcloud both have apps, users who haven’t downloaded the mobile version of either product will be directed into a useable version on their mobile browser. This means you can take advantage of engaging formats like video and audio without disrupting the user experience too much. That doesn’t mean that there are no problems with the native mobile web, though. Tracking is one notable problem, as its transitory nature means it sits uncomfortably between the evolved mobile tracking eco-system and the cookie based nature of the web. 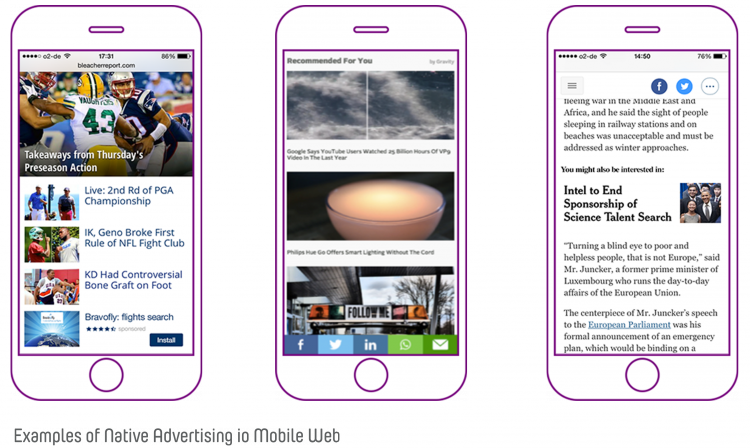 More problematically, mobile web advertising is harder to present in a non-disruptive way. In a mobile app like Facebook, user expects to tap an advert and be redirected onto the App Store. But on the mobile web that’s a bit more difficult because the user experience and expectations are different. If I’m a user on a website, then I’m suddenly bounced to the App Store and then I’m in an app, I wouldn’t call that native. That user experience isn’t natural and can easily frustrate somebody using it. So although you can use native mobile web advertising to drive app installs, it might be better suited to softer branding exercises and content marketing rather than direct performance advertising. Creating a successful native mobile web advert is all about choosing the right format to make the most of your tailored content. There are some options that publisher can choose from: the in-feed unit for a list of articles; the in-content unit, which is placed in the middle of the content or just after the first paragraph; a widget at the bottom, which is a legacy of web but allows for further sharing; a floating recommendation widget which relies on the user to scroll through the whole piece and hangs over the piece instead of being placed at the bottom in a non-viewable area. While it certainly matters that you create the right content for the right type of mobile web page to ensure it is native, it’s important to remember these widgets will drive shares and to design around them accordingly. The key to successful native advertising on any platform is the natural look and feel to the user. So the most important thing you have to think when creating a copy is that it has to be contextualised to the publications and distributors you want to reach, as well as adjusted to your individual business goals. A mobile free to play game targeted at men will have a significantly different marketing strategy compared to an e-commerce app targeted at women. If your target market is likely to read the New York Times and other respected publications, then you’ll need to adapt your copy to reach the thresholds of both class and quality their users expect. Outbrain, for example, tend to serve titles for a maturer audience. But if you’re looking to reach a market that is interested in Buzzfeed, you’ll be looking to serve up punchy tabloid content that would appeal to the users potentially browsing 9gag or Imgur. Native advertising always performs best when it is correctly contextualised. And for native advertising on the mobile web, you need to think like a writer, video producer or podcaster and produce copy that fits the sites that host it. So research publications carefully, pick which ones you want to try out and adapt your copy to give it the best chance to succeed. Because the mobile web is a hybrid between mobile and the traditional internet, it’s not surprising that the way you measure success for a mobile native web advert lies at the intersection between the two. It is important to measure how often pages that feature a native advert are actually viewed, because the content won’t pop up like an interstitial. At the same time, a marketer creating a native mobile web advert also needs to find ways to track a return on investment – despite the fact that tracking on the mobile web is harder. But there are indirect ways of measuring performance. Shares on social media, appearances in services like Google Alerts and clicks/taps to a tracking link through the likes of bit.ly are an important way of quantifying how effectively your message has spread. And if you can keep an eye on whether sharing leads to any unusual upticks in download activity, you can begin to piece together how much of a direct impact the advert has had. Thus, measure your mobile web native adverts differently. By accepting that the KPIs are a fusion between views, shares and performance, you can begin to understand what role native mobile web adverts can play in helping your business.